Out of the Hoboken, N.J. microgrid project comes a toolkit that other cities and towns can use to green — and keep greening — a community microgrid. Here’s the story of how the toolkit came to be and what it offers communities. In the aftermath of Superstorm Sandy, Hoboken Mayor Dawn Zimmer knew it was not a matter of if there would be another devastating storm, but when. Determined to keep the city safe, Zimmer used recovery funds to design a microgrid that would provide back-up power to 55 critical buildings including fire stations, pharmacies and low-income and senior housing. In the summer of 2015, a unique collaboration emerged between the City of Hoboken, Greener by Design and EDF Climate Corps to maximize the sustainability and resiliency of this microgrid. The result was the Resilient Microgrids Toolkit, which engages stakeholders and provides them with the resources necessary to establish and maintain a clean and resilient microgrid. 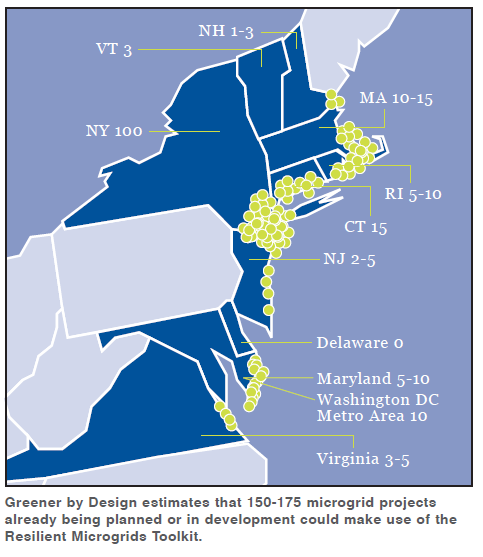 Given that cities up and down the east coast face the same challenges as Hoboken due to rising sea levels, increased dependence on energy and worsening storms, the toolkit was created not just for Hoboken, but for any city looking to establish a clean microgrid – one that integrates renewable energy sources and is thus more sustainable and more resilient in the long term. In October 2012, Superstorm Sandy devastated the city of Hoboken: 500 million gallons of brackish water flooded its streets, homes and infrastructure (70 percent of the city sits in a flood zone). Ninety percent of the city lost power, a dire situation that lasted for almost two weeks, making it an extremely stressful time for both residents and city administrators. The storm damaged critical infrastructure, hampered emergency response teams and left citizens cut off from key resources. Sandy sent a woefully clear message that Hoboken needed to enhance its resiliency before the next big storm. Vowing “never again,” Hoboken Mayor Dawn Zimmer conceived of establishing a self-contained microgrid for the City of Hoboken. The initial goals were to improve energy availability during emergencies, reduce pressure on the main power grid during peak hours and decrease emissions through the adoption of renewables. The city received a technical assistance grant from the Department of Energy to fund the initial analysis for the microgrid project. Brought in to do the analysis, Sandia National Labs identified 55 buildings – including police stations, fire departments, pharmacies, senior facilities and low-income housing – crucial to receive back-up power through a microgrid. Hoboken had enlisted Greener by Design, a private firm, as an energy consultant, and Senior Project Manager Gail Lalla was tasked with turning the idea into a reality. Lalla sensed that to fully engage all the necessary stakeholders – time-strapped people without much experience implementing microgrids – an organizational tool would be crucial to make the job easier. She also recognized that not all microgrids are clean microgrids, so the tool would need to explain the benefits of this forward-looking approach. Greener by Design’s goal was to ensure that a microgrid could become sustainable over time, if not from the start. Lalla faced the thorny challenge of making a case for the future cost efficiency of renewables in the face of up-front costs and a complicated path to monetizing environmental and social benefits. Thus, the seeds of the Resilient Microgrids Toolkit were sown. To create the toolkit, the City of Hoboken and Greener by Design enlisted the help of EDF Climate Corps, a program that trains and embeds graduate students within organizations to accelerate energy projects. EDF Climate Corps fellow Devashree Ghosh, a recent graduate of The New School who had previously worked on a cost-benefit analysis of the Hoboken microgrid, was the perfect candidate to focus on this project over the course of a summer fellowship. Ghosh began her project by conducting a series of interviews. She wanted to determine which specific stakeholders would primarily use the toolkit, in what ways the toolkit could make the most impact and how the toolkit could scale and adapt to different buildings or other communities. She interviewed energy services companies, policy advisors and experts at Greener by Design and EDF to gain as much information as possible. With this ambitious list of goals, Ghosh dove into extensive research on microgrids. She developed a strong understanding of the timeline and the milestones that make up a microgrid project as well as the typical variety of stakeholders involved. She engaged with her peers in the EDF Climate Corps network to understand how other local governments perceived societal benefits, and whether any of the other EDF Climate Corps fellows were working on monetizing the financial, environmental and social benefits of microgrids. She also accumulated insight into the energy markets in New Jersey and mapped out how stakeholders might actually perceive the project. She hoped that by including guidelines in the template about using renewable energy and energy efficiency, microgrid projects would be substantially greener than if these sustainability aspects had not been considered at all. With this information, stakeholders can easily monitor energy efficiency and greenhouse gas emissions for the community. This can then facilitate formal greenhouse gas reporting and ensure that buildings are not using more energy than necessary. In this way, as time passes and as buildings in the microgrid become increasingly efficient, additional buildings can be added to the microgrid. 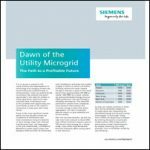 In addition, as the cost of renewable technologies continues to decline, additional generation resources could be added to the microgrid to meet additional load requirements. A Timeline: Microgrid projects can be complex and take several years to implement from research to installation. After all that, they require future monitoring. Because of this, Ghosh created a piece of the toolkit that would generate an adjustable, milestone-based timeline for microgrid projects. This timeline would help toolkit users to successfully navigate these long-term projects and inform all of the stakeholders from the start. A Scorecard: Microgrid projects can look very different depending on factors such as location, power generation, size and purpose. Therefore, Ghosh included a “scorecard” that tallies up points for the various benefits of a microgrid project. These benefits are divided into different categories including environmental, financial and social benefits, and then the toolkit generates a useful graphic to show the categories and the points a specific microgrid project achieves. In addition, the scorecard allows users to compare different microgrid projects. Ghosh wanted this component because she knew it would be avidly used by microgrid operators around the country. Given the amount of investment involved in implementing a microgrid system in a community, these operators want to know how their systems perform relative to other projects. 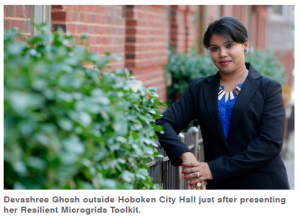 Utilizing this new toolkit, the City of Hoboken hopes to begin installation of its microgrid in the summer of 2016. There are still obstacles to overcome, so strong leadership will be needed from city administrators, such as Marks and Stratton, who will be tasked with deploying the toolkit, engaging remaining stakeholders and then ensuring sound monitoring and reporting. Looking beyond Hoboken, there is tremendous potential for the Resilient Microgrids Toolkit to be used by other cities. The economic losses borne by New Jersey from the catastrophic effects of Superstorm Sandy neared $30 billion, and more than 2 million households across the state lost power. As a result of this high-profile disaster, city managers all along the East Coast have been looking for ways to improve the resiliency of their infrastructure. According to NOAA’s most recent research, 39 percent of the U.S. population lives along the coast, so this toolkit has immense potential to spread. To enable this, Ghosh is working with Greener by Design to transform her Excel-based tool into a dynamic web-based resource with a user-friendly interface. City managers interested in using the toolkit can sign up to learn more here. 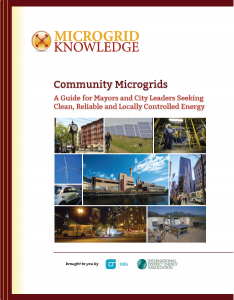 To accompany the Resilient Microgrids Toolkit, Ghosh envisioned the creation of a Knowledge Transfer Network, or a network of experts who would share guidance and lessons learned through an online discussion forum. This type of collaboration could greatly accelerate project success because a major barrier to microgrid projects is that they require in-depth knowledge in an extensive variety of subjects including: city planning, project management, legislative process and policy, stakeholder engagement, finance and environmental sustainability. In this way, stakeholders from different microgrid projects could engage with and learn from each other. Perhaps even more than the Resilient Microgrids Toolkit itself, this Knowledge Transfer Network could further the successful implementation of clean, resilient microgrids. To learn more about the Knowledge Transfer Network and the Resilient Microgrids Toolkit, click here. This article orginated on the Environmental Defense Fund website.